"This is a story about a paradise lost. . . . In 1978, in the final, bloodiest phase of the Rhodesian civil war, eleven-year-old Lauren St John moves with her family to Rainbow's End, a wild, beautiful farm and game reserve set on the banks of a slowflowing river. The house has been the scene of a horrific attack by guerrillas, and when Lauren's family settles there, a chain of events is set in motion that will change her life irrevocably. Rainbow's End captures the overwhelming beauty and extraordinary danger of life in the African bush. Lauren's childhood reads like a girl's own adventure story. 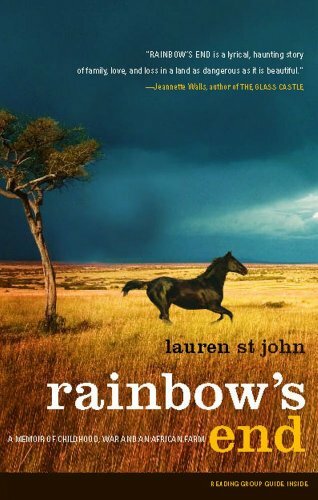 At the height of the war, Lauren rides through the wilderness on her horse, Morning Star, encountering lions, crocodiles, snakes, vicious ostriches, and mad cows. Many of the animals are pets, including Miss Piggy and Bacon and an elegant giraffe named Jenny. The constant threat of ruthless guerrillas prowling the land underscores everything, making each day more dangerous, vivid, and prized than the last. After Independence, Lauren comes to the bitter realization that she'd been on the wrong side of the civil war. While she and her family believed that they were fighting for democracy over Communism, others saw the war as black against white. And when Robert Mugabe comes into power, he oversees the torture and persecution of thousands of members of an opposing tribe and goes on to become one of Africa's legendary dictators. The ending of this beautiful memoir is a fist to the stomach as Lauren realizes that she can be British or American, but she cannot be African. She can love it -- be willing to die for it -- but she cannot claim Africa because she is white."